So what happens if you buy a huge salmon as such? Due to high demand of requests from friends who wants to know how to do this, I will use pictures to illustrate how I slice my salmon into sashimi and nigiri. As you can see, I have given instructions to my fishmonger to take the skin off for me. This was because I was in a rush for time. Normally I take the salmon skin off myself for hygiene purposes. First of all, orientate yourself with the salmon. You can see that there is a line in the middle of the salmon. If following the above picture, on the right is the thicker part of the salmon so this is used for sashimi, the left is wider and thinner so this part is used for nigiri. Divide the salmon in the middle. when I say middle, can you see the line in the middle of the fish? The line has to be towards the nigiri (the thinner side) side as shown below. Slice the part with the line off as shown in the pictures. This is because that part is quite ‘fibrous’. But it won’t be wasted, save it for making rolls. There you go! the whole strip where the line was is completely sliced off now! After trimming all the fats, slice off the side to make it look neater. You can save the trimmings for the rolls so don’t throw them away. Angle your knife at 45 degrees. Slice in one direction and one motion preferably from the end to the tip of the knife. Not in a sawing motion! There you have sliced off the firs nigiri piece. 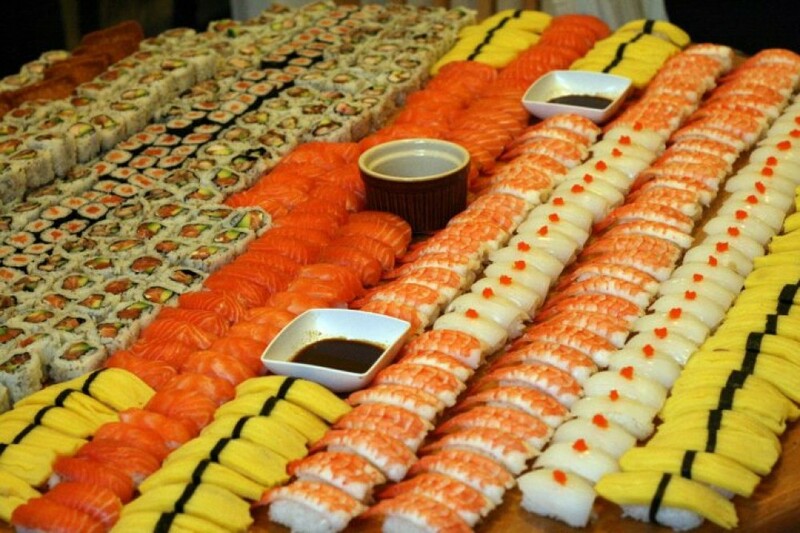 There you have got all ur nigiri pieces lined up. Now for the sashimi! Turn the other part of the fish around and start trimming the fats. Turn the sashimi part back again to its original position after trimming the fats and start slicing as above. Approximately 1cm thick? Again, slice in one motion starting from the end of the knife to the tip of the knife. No sawing motion or you going to destroy the fish! Now you have loads of sashimi to eat to your heart’s content!!! This entry was posted in japanese, sushi and tagged cooking, japanese by stephylicious. Bookmark the permalink. Wow, where do you buy such a big fillet that’s sashimi grade? How do you also store it? Sorry for the late reply, have been busy on a stretch of on call shifts. you could buy it from your local fishmonger. You tell them that you are looking for a salmon fillet (you can ask them if they have any in their fridge stock) and state that you want it to be sashimi grade because you are eating it raw. It’s about trying a few fishmonger and choose the best one you prefer. Store it in a fridge after you get home. It can last until the next day but i recommend eating it on the day you buy it as you will notice that it becomes a bit watery the next day..